So, we’ve been planning. For hours. Days. Weeks, actually. It seems ridiculous. We can’t remember it ever being this hard to figure out our route before. After FIFTY-FOUR countries, you’d think we’d have this down…but apparently not. For some reason, Austria and Slovakia are giving us a run for our money. Maybe it’s just that we are coming at them with fewer pre-conceived notions of what we want to do? Or maybe it’s just that now we’re trying to balance what we want with what we can reasonably expect a 3 and 1-year-old to put up with? But we’ve traveled with our kids before and never had this much trouble, so it doesn’t seem like we can blame it on them. Day 1 – Fly to Munich. Day 2 – Arrive Munich. Stumble onto subway and attempt to feed our children before we collapse at our hotel. Day 3 – Attempt to explore Munich. Day 5 – Pick up rental car and drive to Salzburg. Explore some of the sights. Day 6 – Continue to explore Salzburg. Day 7 – Drive to Krems via Melk and it’s Abbey. Day 8 – Take the bus/train to Melk and return to Krems by boat down the Danube. Attempt not to lose any children overboard. Day 10 – Spend the day exploring Vienna, trying not to be bitter our son’s not old enough to see the horses yet. Day 13 – Drive to Bojnice, Slovakia and see the castle. Day 14 – Drive to Bardejov and see its square and at least one wooden church along the way. Day 15 – Drive to somewhere in the Spis area. Levoca? Day 16 – Stay in the area, see the castle. Day 23 – Drive to Innsbruck and explore what we can. Day 24 – Drive to Liechtenstein. Day 25 – Explore Liechtenstein and drive to Fussen. Day 26 – See Neuschwanstein Castle and return to Munich. So? What do you think? Are we crazy? Is this do-able? What have we missed? What should we change? Is there a better way to do this route? We are open to any and all suggestions including hotels and restaurants. The only thing we’re sure we don’t want to do is the Sound of Music tour. 😉 Any other recommendations would be warmly welcomed! It should be doable if a bit fast. I never feel the need to have more than a day in Salzburg. As a town, I have been a few times and never really feel that there is much to do. Maybe you find more with some research though. I am not such the museum person either. Are there age restrictions on the horses? Do you mean the Spanish Riding school? That was awesome. We really liked Leichtenstein last year, though it is expensive in places. I have a few posts on it if you are interested. We stayed up the hill in Triesenburg and really enjoyed the view even though the town itself is tiny. There is another town in the south on the flats called Balzers I believe that had a castle. We saw it on the bus leaving, so didnt get to stop. Looked awesome though. Looking forward to reading more ont he Eastern stuff. As much as I havespent time in Vienna and love it, I have not gotten into Slovakia. Prague keeps drawing me back. I think your intinerary looks great, it´s just a lot of driving! Don´t underestimate the distances. From Bratislava do Hallstatt it will take you 4-5 hours with kids. If you have any further questions, regarding Austria, I´m happy to help you! You’re crazy. – Anyway, regarding to Austria, I think you made a good choice and I hope you enjoyed your stay. Sounds like an amazing trip. 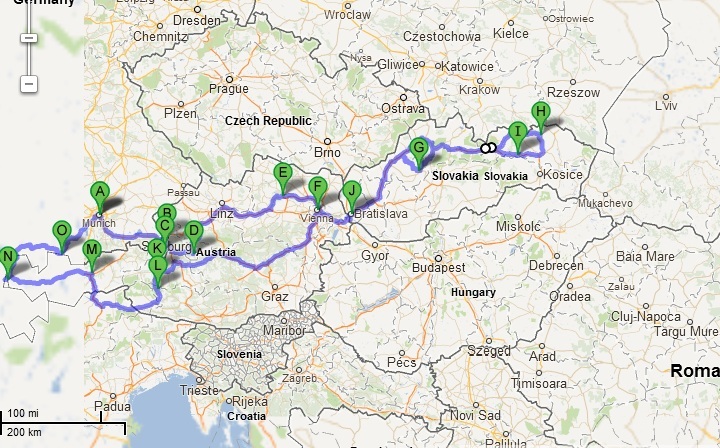 We’re off next week to do the center part of this journey – Vienna, Prague and Bratislava. Can’t wait!